Peppermint oil has a clean, energizing scent that makes it popular in aromatherapy for elevating your mood and gaining mental clarity. Studies back the science behind its mind-enhancing effects, as it’s been shown to lower stress, sharpen your focus and even improve your memory. Its aroma is impressively strong, so you require only 1 or 2 drops of it for significant effects. In aromatherapy, peppermint is regarded as a stimulating oil that lifts your mood and improves mental performance. A study has shown that inhaling peppermint oil improves cognitive abilities, including concept formation, memory function, attention span and reasoning. It also relieves stress, reduces anxiety and promotes mental calmness and clarity. It’s ideal to use when you need to take a test or perform well in another high-pressure situation. Peppermint oil feels like a biting coldness is sweeping through your nostrils when you inhale it. As it turns out, it works much like menthol and camphor, which are used in vapor rubs as decongestants. In fact, menthol is a compound found in peppermint oil. Peppermint oil works to naturally clear up your sinuses and respiratory tract by opening up the bronchial and nasal passageways, lowering inflammation and expelling mucus . Peppermint oil can fight allergies by relaxing the muscles in your nasal and respiratory passageways, which get inflamed during allergy season. One study showed that menthol, an active plant compound in peppermint oil, effectively treats chronic allergies, colitis and bronchial asthma by lowering inflammation . You can inhale peppermint oil using an essential oil diffuser or adding a few drops to steaming hot water to help with symptoms of allergies, sinus infections and respiratory infections. You can also create your own vapor rub by mixing a few drops of peppermint oil into vaseline or a carrier oil like coconut or olive oil and applying it to your chest and upper lip. Research shows that simply inhaling peppermint oil brings instant enhancements to your athletic abilities. It improves exercise performance by enhancing respiration, which in turn boosts the amount of oxygen your body receives. Athletes who inhale peppermint oil before exercising have a lower respiratory rate and heart rate because of the way peppermint oil smooths the bronchial muscle, allowing more air (and oxygen) to flow in with less exertion . As a topical salve diluted in a carrier oil, peppermint oil can relieve aches and pains, including achy joints, headaches and more. It has cooling, antispasmodic qualities that relax muscles and release tension. You can try rubbing it into your temples to relieve a tension headache; one study showed it relieved headaches as effectively as Tylenol . It may work as a topical analgesic also by altering the way the body perceives and reacts to pain. Peppermint can help relieve symptoms of irritable bowel syndrome (IBS), including diarrhea, constipation, nausea and vomiting. It works as an antispasmodic to relax your intestinal muscles and alleviate bloating and gas . In a study on 57 people with IBS, 2 peppermint oil capsules ingested twice a day for a month cut IBS symptoms in half for 75 percent of the participants . You can take 1 or 2 drops of peppermint oil internally before each meal, and apply 2 or 3 drops to your abdomen for symptom relief. 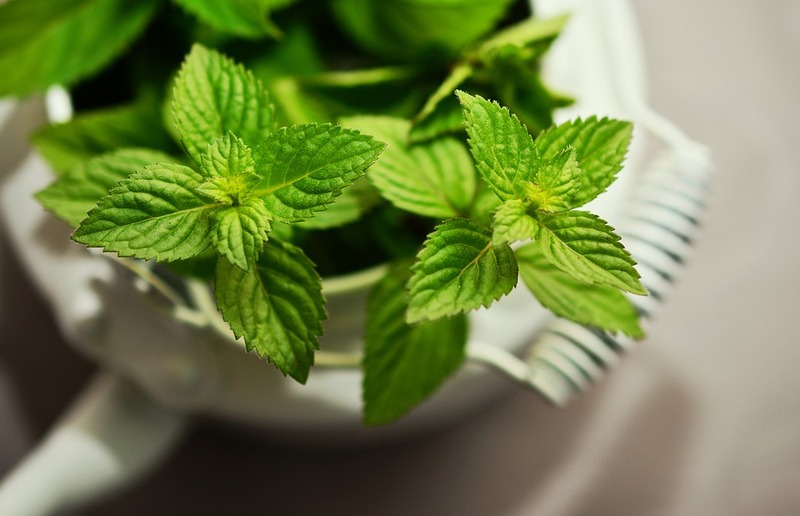 Peppermint’s cooling and refreshing scent is ideal for combating bad breath . Its antimicrobial properties kill oral bacteria that causes it . This also helps prevent cavities and other dental issues. To kill bad breath, apply or brush a drop or two of peppermint oil on your tongue. Or, add it to water for a mouth rinse or add to a spray bottle for a mouth spray. You can diffuse peppermint oil to keep mosquitoes, flies and other bugs away at home, and you can use it in a homemade all-natural bug spray when you go out. A scientific review of plant-based bug repellants determined that peppermint is among the most effective natural insect repellants, and it’s even been used in folk medicine to prevent malaria . Another study that tested peppermint oil against mosquitoes found that it provides 150 minutes of full protection against them when applied on the skin . The protective plant chemicals in essential oils can make them useful for protecting against sunburn, and evidence shows that peppermint oil has a higher SPF than most other essential oils . Peppermint oil’s cooling and soothing properties also make it helpful for treating sunburn. Applying it to your skin in a carrier oil can help relieve painful, itchy sunburns, especially when the mixture is chilled in the refrigerator . The active phytocompounds in peppermint essential oil can do amazing things for your hair and scalp. Use it as a natural remedy for hair loss, thinning hair and dandruff. It works as an antiseptic for your scalp that can stimulate the hair follicles. A study on mice showed that applying peppermint oil to the scalp daily for 4 months brought about more hair follicles and greater follicle depth. This suggests that peppermint oil can promote the growth of fuller, stronger hair . Menthol is a powerful compound in peppermint oil used in many anti-dandruff shampoos . You can add a drop or two of peppermint oil into a dollop of any shampoo to fight dandruff. Peppermint is can help expectant mothers who need a natural remedy for morning sickness. Simply inhaling peppermint oil from the bottle can relieve feelings of nausea. You can also add a few drops to an essential oil diffuser to spread the aroma around a room, or put a few drops on a cotton ball or handkerchief to inhale it as needed. Peppermint oil is safe for topical use, but it’s wise to try combining it with a carrier oil like coconut or olive oil before using it directly on the skin, in case of any irritation or reaction. In small amounts, you can consume peppermint oil. As a general rule, essential oil consumption should be limited to no more than 3 drops a day because of its potency. It can cause heartburn in some people when taken orally. There are many ways you can reap the benefits of peppermint oil through aromatherapy. Try adding a few drops to a diffuser or a warm bath, or even inhaling it directly from the bottle. You can use it in household sprays and homemade beauty products to weave some additional aromatherapy into your life.